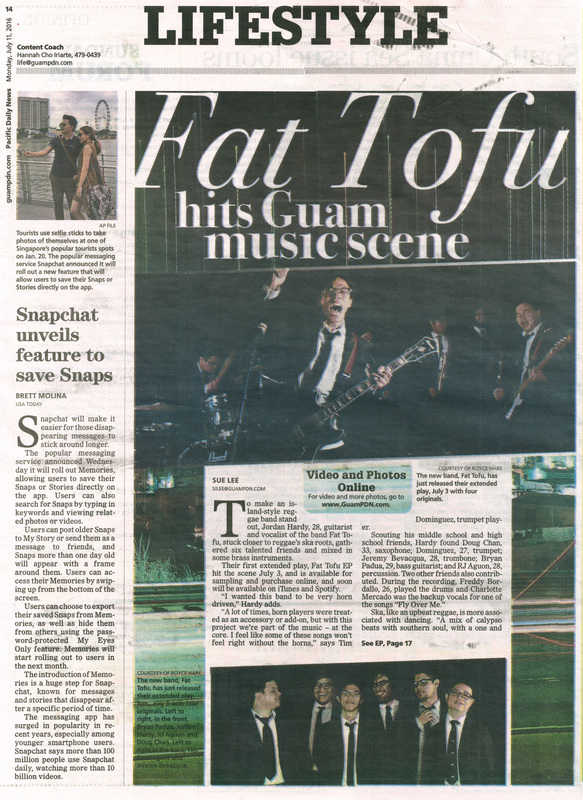 Doug Chan - Guam-raised musician, educator, and software developer. Lots of other places suggestion using text-shadow to handle bold hover/active states. My client had a complaint that it made the text look blurry (which it absolutely does). Here’s my solution (written using general CSS selectors). Let me know what you think! The letter-spacing is not perfect, and there is still a tiny sub-pixel of movement, but it was a compromise between actually-bold text and blurry-bold text. Adjust to your needs. I spent a number of hours yesterday trying to figure out how to customize individual links for the main menu. Drupal 8 is a bit more straightforward, but it isn’t quite so obvious in Drupal 7. There are no template suggestions or theme hooks in the HTML comments when you turn theme debugging on, so it took me a while to figure it out. Here’s my code that allows me to replicate the menu links exactly. Then customize as you wish. Open PhpStorm preferences (⌘,) and go to the Code Sniffer settings. Click the “…” button. Enter the path to your “phpcs” file and click “Validate”. 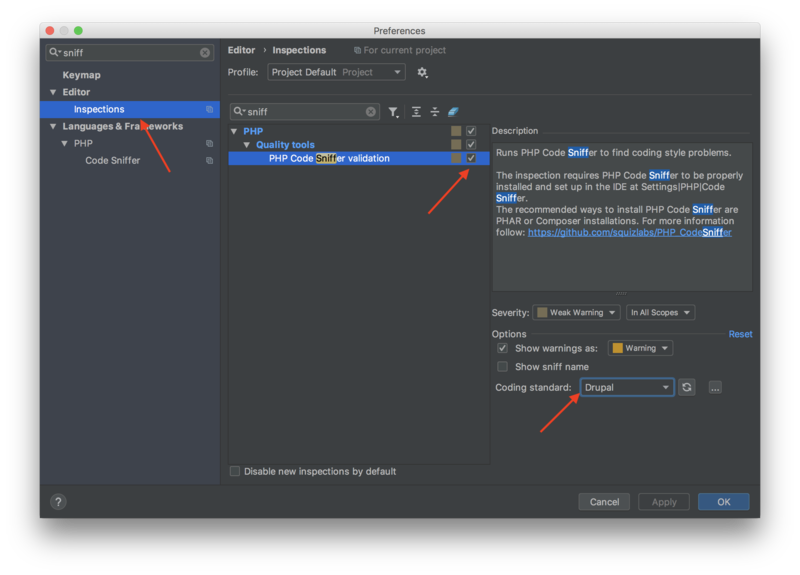 It should be ~/.composer/vendor/squizlabs/php_codesniffer/scripts/phpcs (replace “~” with your actual home directory) Go back to the PhpStorm preferences, navigate to “Editor » Inspections”, enable “PHP Code Sniffer validation”, then choose “Drupal” in the “Coding standard” dropdown. Enjoy! Documentation for Drupal 8 is still really lacking. There is SOME documentation out there, but in typical Drupal 8 fashion, you have to sift through all of the pages and all of the content to find exactly what is relevant to you. This guide is an attempt to get you quickly started. This guide is for dummies, but it also assumes you know the basics of Drupal 8. Specifically, you should be comfortable getting an installation of Drupal 8 up on your own, you have you’re comfortable editing text (config) files, and you have basic site-building skills (Creating content types, creating views, etc). 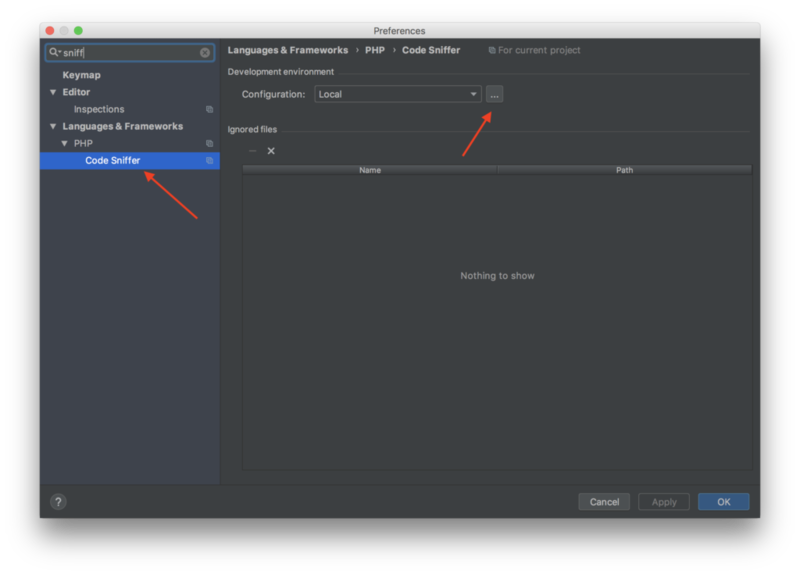 Before we get started, I want to say that, when I am making an API for a new app, I want to make it FAST. I am comfortable working with the MEAN stack (using MongoDB + Express to run your API server), but I consider myself fairly proficient in Drupal, so why reinvent the wheel every time manually writing an API when Drupal already does a great job at assembling and delivering data? 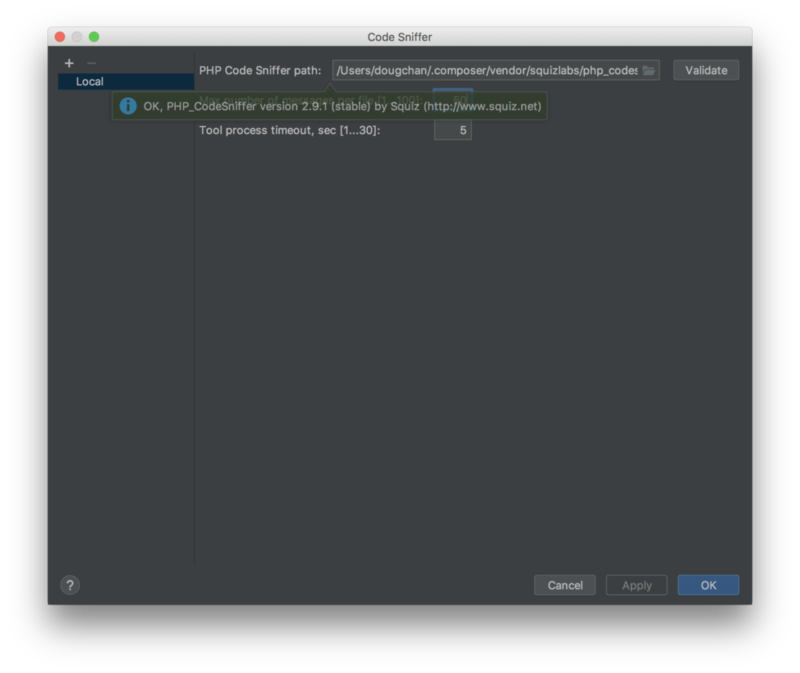 I’m able to get my API working with GET requests in less than 5 minutes, and POST requests in less than 15 minutes. OK, enough small talk – lets get started. Thanks to iFactory for putting me through Acquia certification! I definitely would not have passed without having learned so much from working there in the past 5 months. Interesting outcome since I feel that I’ve been really comfortable with my frontend development. Ah well. Feels good to finally be done with the exam! I’m in the news! I started a new job almost half a year ago as a Drupal developer. 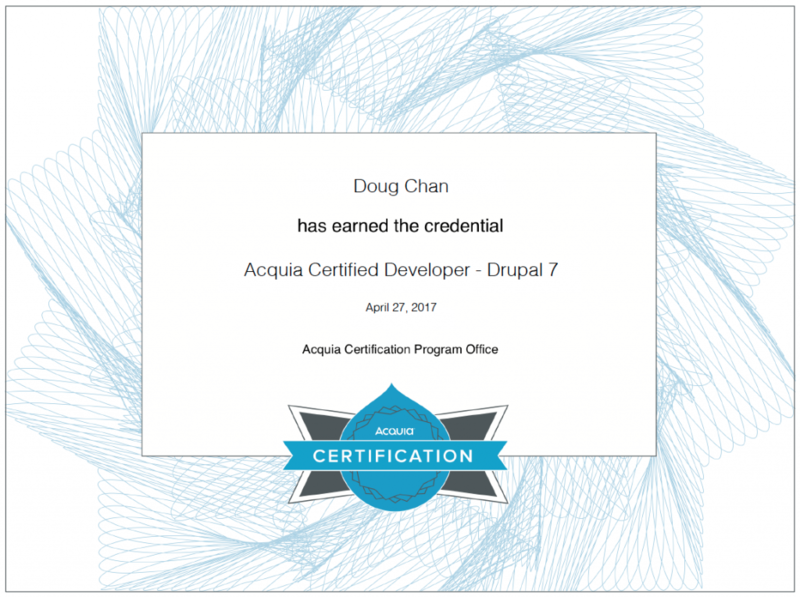 When I started developing with Drupal almost about 6 years ago, I had no idea that it would take me this far. I always thought that Drupal was way more trouble than it was worth. Well, it turns out that all my learning paid off! 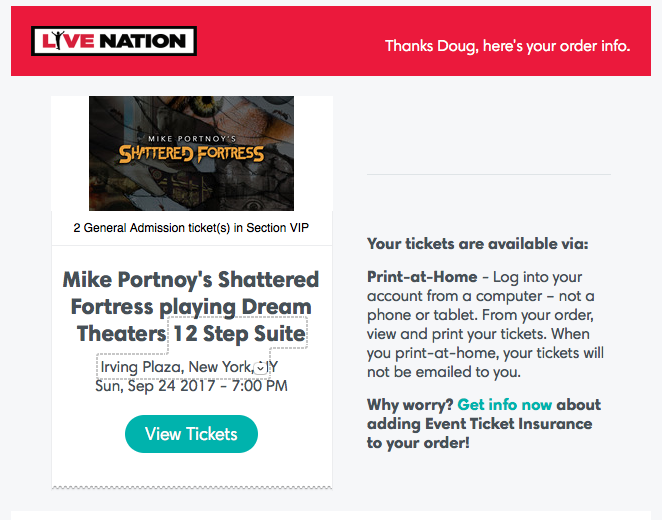 Going to Mike Portnoy’s Shattered Fortress!! I bought the tickets the moment they became available. Can’t wait to go to this ONCE IN A LIFETIME event!! It’ll be awesome to see how other musicians put together this music by Dream Theater. I couldn’t find a good tutorial on how to do this from the ground up, so here is a definitive one that’ll get you started. Ok, let’s get started! Here’s a basic new installation. Yay. Boo Ada (aka Master Random) paid me a visit in Boston! Listen to us talk about music and other random stuff. I Updated My Web/App Portfolio! I made some updates to my Web/App Portfolio page. 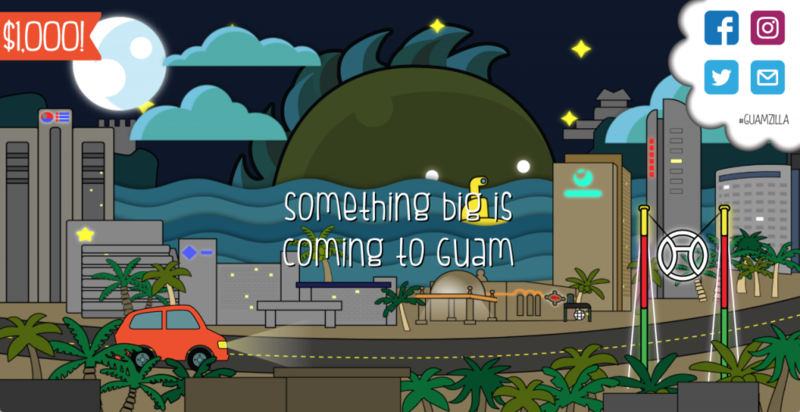 I released the Shoot Shoot Guam app over the summer, and I was hired by Guamzilla to create a fun teaser page for them. Go there and check it out! A still screenshot of my latest creation (art by John Bermudes). Lots of animations, go check it out! Thanks to my friend Tim sending me so many links from /r/battlestations, I’ve been thirsty for an ultrawide display. I found a good deal for one on Amazon in their refurb warehouse, so I bit the bullet and bought one. Although I did read that they were compatible with Mac, I didn’t know if they’d be compatible with mine. Let me just clear it up for the record: yes it does work! The refurb only came with a display port cable and no mini-dp adapter, even though the manual said it should have, so I had to wait an extra couple days and order one. 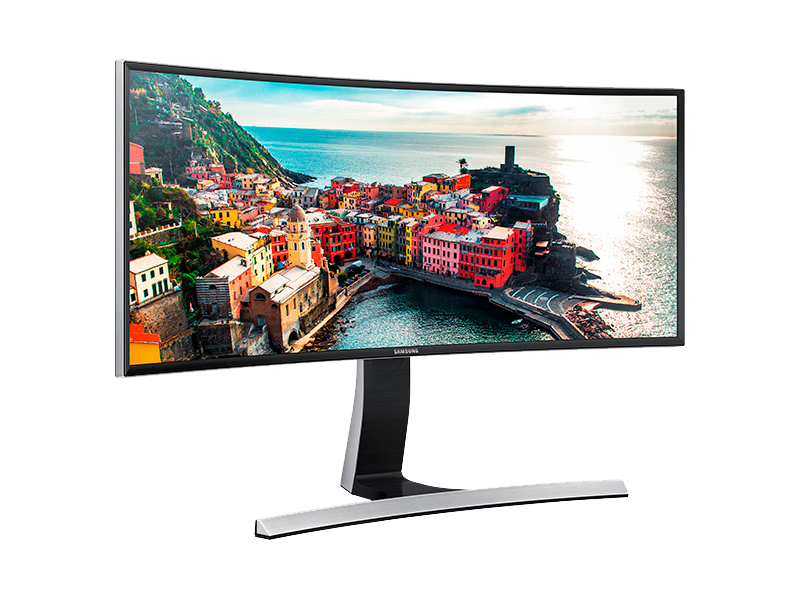 I was scared that it would need an active dual-link DVI adapter like my Crossover 27″ IPS display, but to my surprise, it didn’t! It worked directly with the display port cable (with the adapter) on both my Retina iMac and my 3-year-old MacBook Air, so I am one happy camper. And let me tell you, this is the most beautiful display I have ever used, ever. My current battlestation! Retina iMac on left, Samsung curved 34″ in the center, Crossover 27″ IPS on the right. Since moving to Boston, everything is way more accessible to buy now. With that in mind, I knew I needed to buy some new peripherals, but I wanted to try them first. After all the testing, reviews, and research, I settled on the Apple Magic Keyboard and Logitech Bluetooth Mouse M557. And here’s why. So this keyboard feels like the new keyboards they have on the new Apple Macbooks. I wasn’t a fan of them at first, but holy cow, this thing feels so good for my worn out hands. I suffer from RSI due to a pinched nerve in my neck, so the lesser travel on the keys and easy pressing works VERY well for me. It might not be for everyone, but my hands don’t get tired anymore, and I can type and code for extended periods of time without getting tired now. Even typing on my MacBook Air feels awkward now because I’ve gotten so used to this keyboard. First things first: I hate the Apple Magic Mouse. Don’t get me wrong, it’s a great mouse, but it is an ergonomic nightmare. I even tried buying this thing online that makes it thicker, but it still made my hands sore. So I had to look to other solutions. This wasn’t an easy choice. I’ve been using this older Logitech wireless mouse with USB dongle for years and have loved it to bits, but it was starting to break. Since I was getting tired of USB dongles, I looked to bluetooth solutions. I owned another Logitech bluetooth mouse in the past and wasn’t a fan of it, but I came across this, and it reviewed great, so I tried it. The buttons were just like that of the Apple Magic Keyboard: very easy to press. The size of the mouse was the perfect thickness that my small hands craved. This was it. I bought it, and I’ve been using it for about a week now and couldn’t be happier. So if you’re on the same boat as me with some wrist problems that need something that makes it easier on you, I highly recommend these two peripherals. Just make sure you go to the store to try them first. 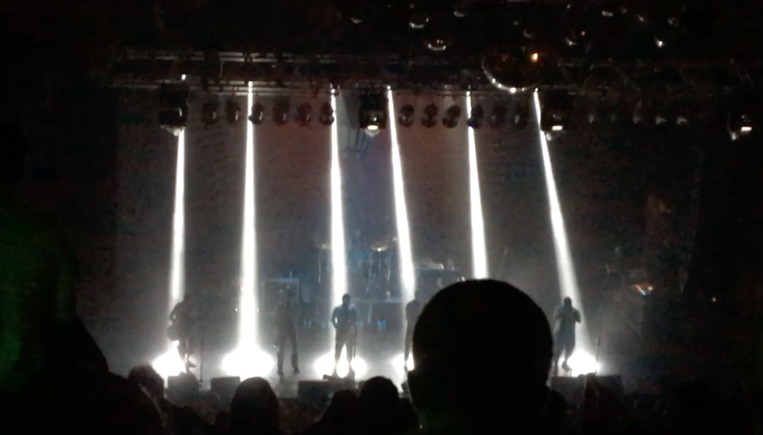 Just watched Streetlight Manifesto last week at the House of Blues! Although I’m fairly new to the ska genre, I knew I had to see these guys. I don’t know all their songs by heart, but I’ve listened to them several times on Spotify, and I love their sound. And what a great first concert of many in Boston. Their 5 piece horn section was so beautiful. I almost cried whenever they’d play their extravagant and virtuosic horn lines. As a matter of fact, I did cry several tears of joy during their opening number. The horns’ massive sound hit me in the face like a ton of bricks, and I couldn’t help but feel like I was engulfed in such heavenly sound. Their fanbase have so much energy, too, and I was feeling it the whole time. Definitely going to catch these guys again! Woo! Coming from living on an Island for the last 15 years (and 10 years more prior to that), moving back to the city is quite a breath of fresh air (or stinky air, considering I live in Allston)! 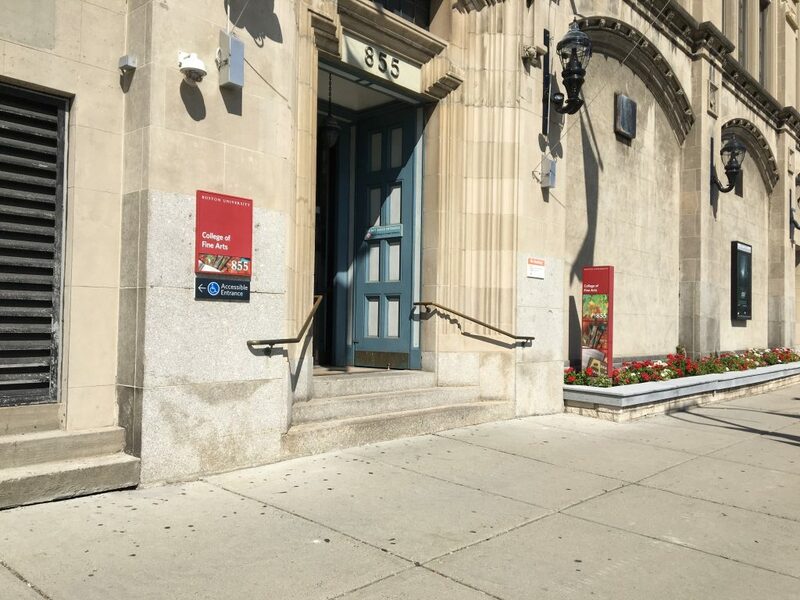 I moved here to start working on my masters degree in music education at Boston University. Being a few weeks in, I already have so many stories to tell, but so little time to tell them. While I don’t have too much time to blog, I’m just going to keep my blog posts on the shorter side, just so I have things to look back on. No one really reads my blog anyway, so enjoy, future me! And just to close, I am super loving it here so far. Until next time! The CFA building here at BU aka my 2nd home for the next two years. 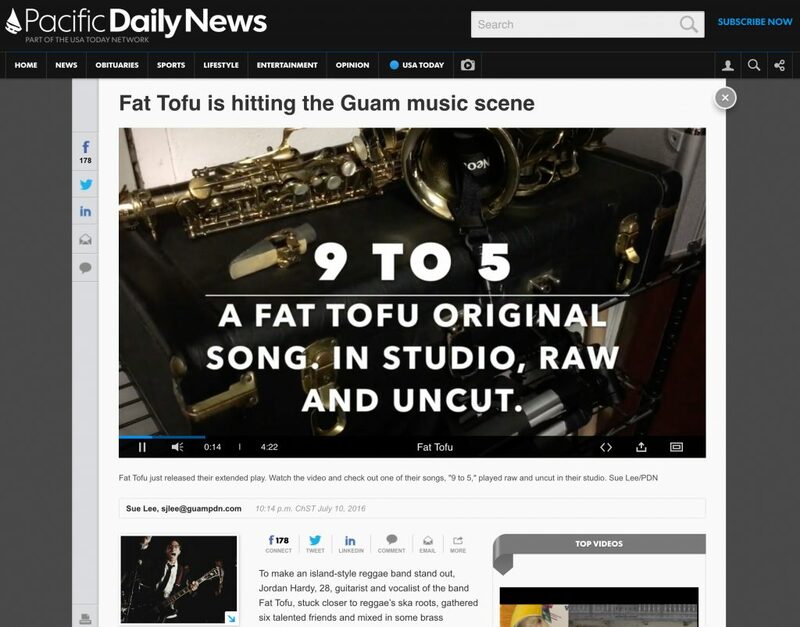 Fat Tofu Featured On The Pacific Daily News centerfold! 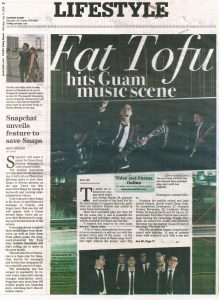 Fat Tofu on the GuamPDN.com Website! 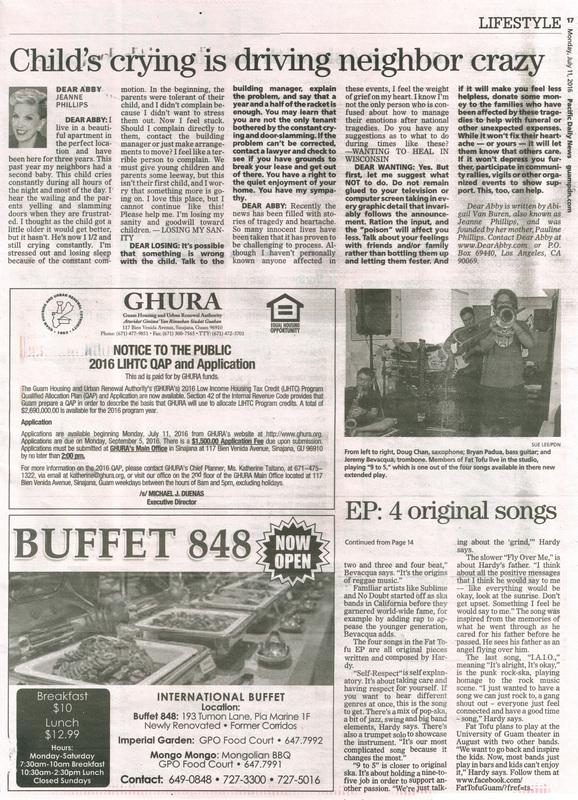 Check out the nice writeup by Sue Lee! Complete with a live video performance of one of our rehearsals. Fat Tofu on Live Local Fridays (i94 FM)! 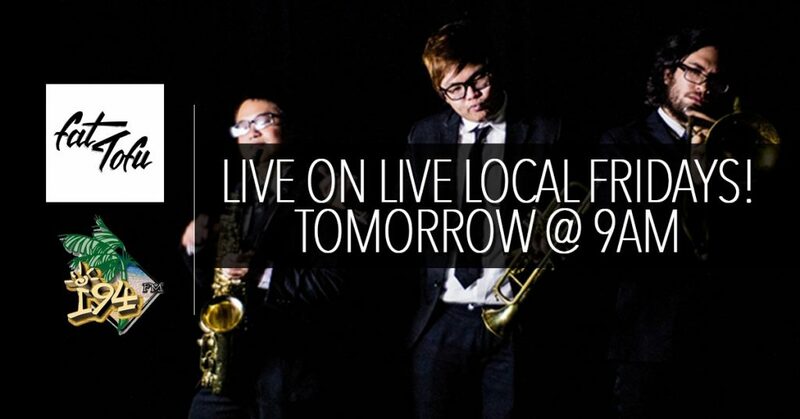 Tune into i94 tomorrow at 9am to listen to us play some music for you guys! 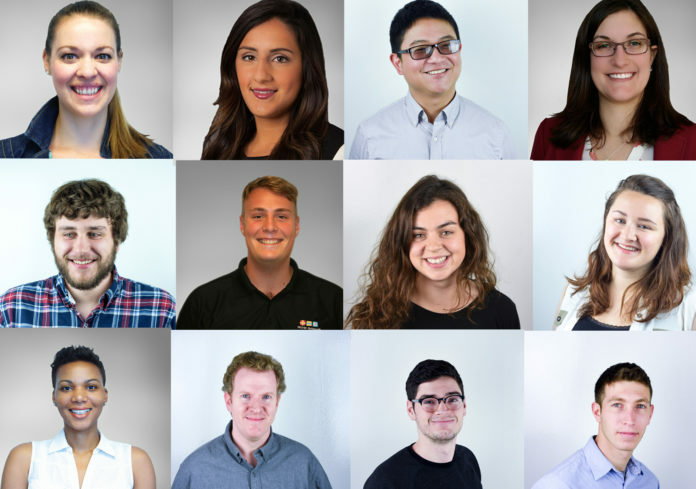 Check out this cool event I have the pleasure of being a part of! A bunch of us formed a backing band to play behind some of the most amazing local rappers. 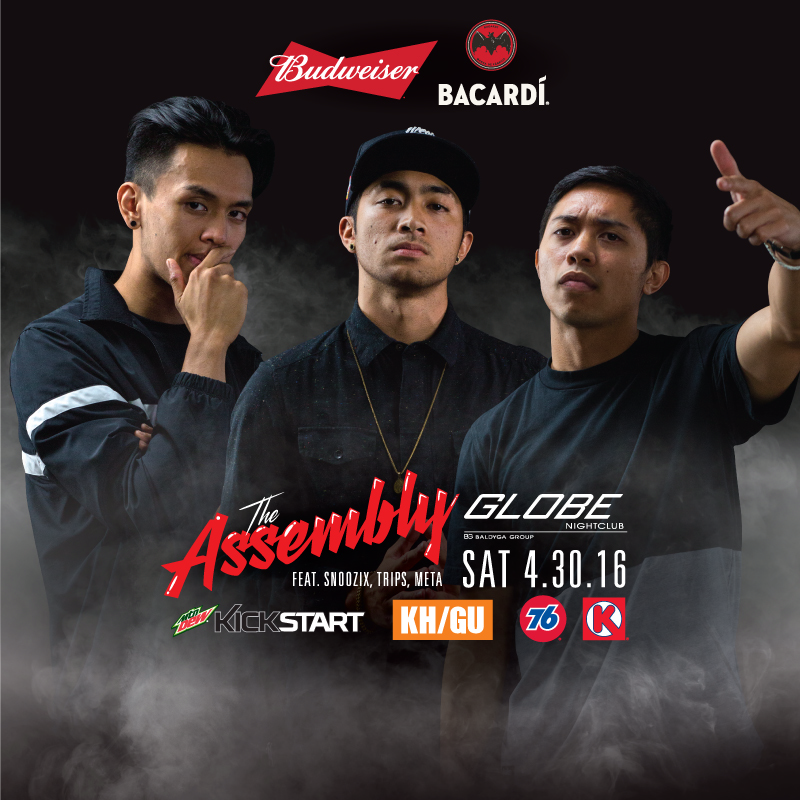 Doors open at 9pm, and the music begins at 10am! Come check us out! 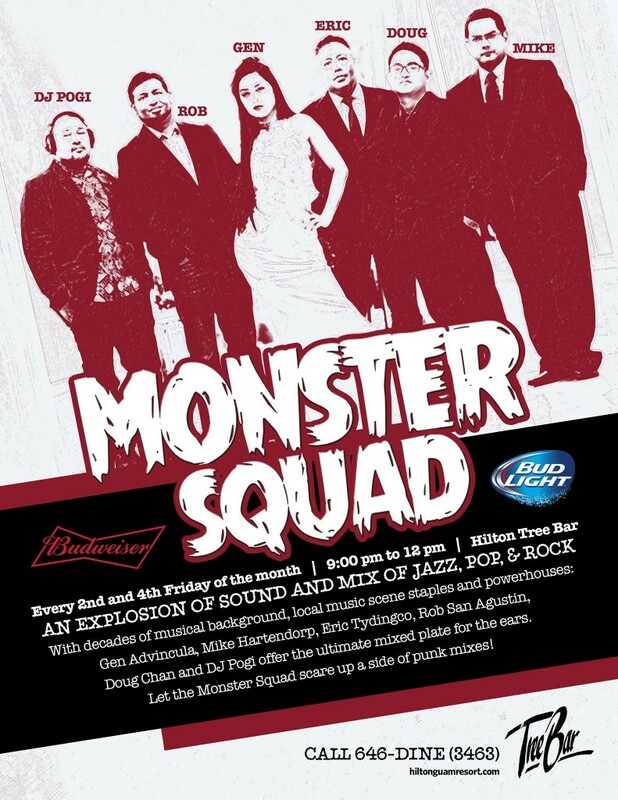 We start tomorrow night, Friday April 8, 2016, from 9pm to Midnight! I’ll be playing sax and doing sound. 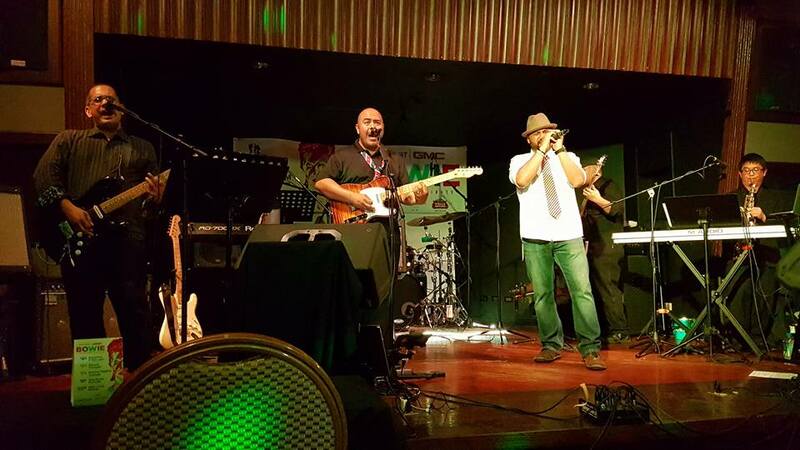 We also had a couple guest singers come on stage for a few sings: John Leon Guerrero and Edgar Flores. 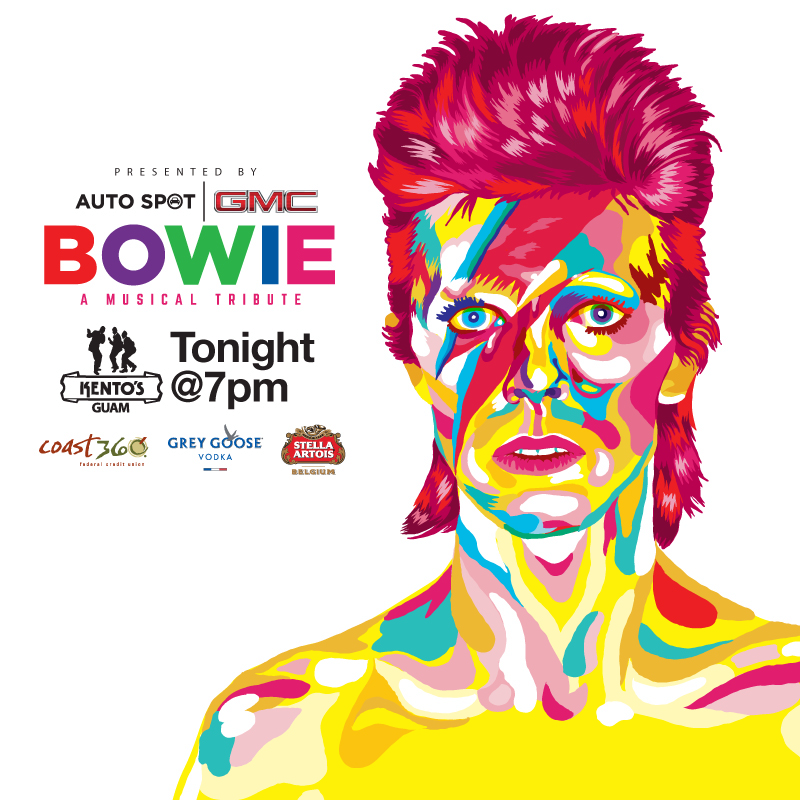 Many of us weren’t really Bowie fans getting into this. I think Mike was the only one who listened to Bowie extensively. The rest of us are definitely big fans now after putting on the show. Some videos will be coming up soon with footage from the event. Stay tuned! Probably one of the most rewarding concerts I’ve had the honor of playing for! I got called in last minute to fill in for 2nd oboe (thanks to my student Jia Jia for letting me borrow her nice oboe). 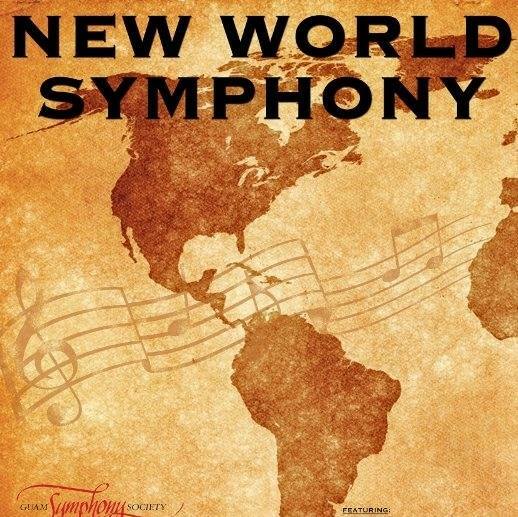 We’re going to be playing Liszt’s Preludes, Dvorak’s New World Symphony, and Rodrigo’s Guitar Concerto (performed by Guam’s own Dave Duenas). I think my favorite part about this concert though is playing alongside Kendra Johnson. She got her master’s degree in Oboe performance, and I’ve never played with anyone with such a beautiful tone. She’s also super friendly and full of great information and loves to share advice, so it’s been just a great experience overall. Check out her website at http://www.kendrajohnsonmusic.com! 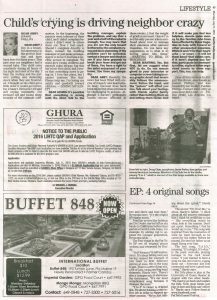 Performance dates are February 27 at 7:30pm and February 28 at 3:00pm at Lotte Hotel Guam. 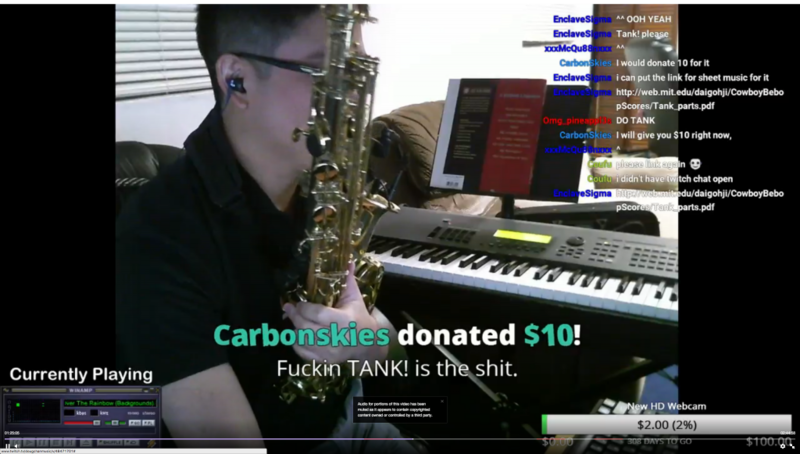 I just streamed for the 2nd time today and got my first big donation of $10 to play Tank! from Cowboy Bebop. Haha wowza streaming is so fun. FoxFu presents Mario Sleigh Ride! For our next trick, we present Mario Sleight Ride! Tim’s sister, Regina, did the video editing on this one. Not bad for her first one! This is a cover of the version created by the OneUps. My latest masterpiece! It’s been something I’ve been wanting to do for a long time, and I finally got around to doing it. It took me over 150 hours of recording, audio editing, and video editing, but (hopefully) it was worth it!